We’d love your help. Let us know what’s wrong with this preview of Allie All Along by Sarah Lynne Reul. To ask other readers questions about Allie All Along, please sign up. I like the methods the story used to deal with anger. We often expect kids to be in control of their emotions without giving them the proper tools. Love Sarah Lynne Reul's use of color in Allie All Along. I'm a sucker for anything presented in rainbow color order. Besides delighting in the color palette, this book also contains good anger management strategies for the little ones in your life... whether they be at home or in the classroom. Lastly, readers will learn various synonyms for the word "angry" that they can incorporate into their growing vocabulary. Got anger? Get Allie All Along! Loved this. A wonderful and funny book, great for a read aloud to help kids deal with angry feelings. Anger sometimes can be overwhelming and tough for youngsters, and this gem has the humor and practical techniques to help let those feelings out. Loved the illustrations too. To reinforce healthy ways to cope with anger. Sterling Publishing provided a review copy. Allie's brother helps her process her anger over a broken crayon. T and I both like this book immensely. Since it arrived in the mail about two weeks ago, he has asked for it as his bedtime story almost every night. One of his favorite aspects is the endpaper. The front endpaper depicts a broken crayon against a backdrop of red scribbles. The back endpaper depicts that same crayon taped back together against a backdrop of a rainbow. He loves flipping back and forth, comparing the anger and happiness over the broken and repaired crayon. I have to limit how many times he may do this, or we'd never get to bed. I've acknowledged before that my reviews tend toward strong praise. This is deliberate - I usually seek out books for specific reasons, and I often find what I am looking for. Allie All Along is no exception. It is narrated by a child observing his sister's anger. He validates her feelings, identifies with her, and coaches her on healthily handling them. From punching a pillow, squeezing a stuffed animal, taking a deep breath, and counting backwards, to a final hug, he sets a positive, realistic, and doable example for not only his sister, but children reading the book. Observers will note that on the hardcover, beneath the book jacket, the brother has fixed the crayon (just like on the final endpaper). I could continue to laud different aspects of Reul's book, like the loving relationship portrayed between siblings, but I will just say that it is worth reading to kids who get angry. And what kid doesn't? Son: I think the little boy drew Allie and then covered her up in a monster costume. Mom: Why do you think he covered her up in a monster suit? Son: Um, I don't know. Mom: I don't think that he covered her up. I think that the artist, Reul, wanted to show that Allie's anger made her feel like a monster. Son: Why was she angry? Mom: Well, what happened to her crayon on the first page? Mom: And that made her angry. What makes you angry? Son: When it is time to go to bed. Mom: Did you think those were good things she did to help with her anger?...What might be good for you to do? Son: Yeah. I would want to blow at fingers. Mom: If you met Allie, would you tell her anything else she could do to help herself? Son: Yeah. She could read a book, a book about angry monsters because she's angry and the monsters are angry. Mom:Would you want to be friends with Allie? What would you want to do with her? Son: Yeah. I think she would want to color and go to Mohegan Sun. Mom: Sometimes when I'm angry I feel like growling like a monster. What do you feel like doing? Hello, friends! Our book today is Allie All Along by Sarah Lynne Reul, a tale of a big brother helping his little sister with her emotions. When Allie’s crayon broke during coloring time, she became – quite suddenly – and furry red ball of rage. After screaming, shouting, and letting it out-ing, the Allie-monster sheds her layer of red fur, revealing a smaller orange monster inside. From there, big brother attempts to help, giving Allie ways to deal with her anger – hugging her favorite toy as hard as she can, taking a deep breath and blowing out pretend candle, etc. Each activity helps Allie feel a little better, and shed another layer of fur: orange to green, green to blue. At last, Allie and her brother have worked to calm her feelings, and the real Allie – a regular little girl – emerges from the last monster layer, requesting a hug. A very interesting take on runaway emotions. I loved the practical ways of helping oneself or others calm down, which are always great for both kids and parents to have in their back pockets. And the metaphor for different levels of anger is both clever and cute – the rage monsters never really appear scary, but more a manifestation of those all-too-familiar tantrums (it should be noted when discussing with kids, monstrous tantrums like that may be appropriate for little ones, but are not acceptable for adults). The illustrations are colorful and thoughtful, and JJ loved watching the monster change. It might have helped to have an earlier indication that there was a little girl underneath all that anger – JJ seemed confused by that – but otherwise we really enjoyed it. A nice book for little readers’ emotional toolkits, and Baby Bookworm approved! A sweet story about helping a kid deal with her anger. Allie gets over-the-top upset about a small thing -- as often happens, to children and adults alike -- and transforms into a furry red monster, the illustrations really conveying the feeling of being angry. Her brother offers her non-destructive ways to channel her anger, and each one helps level down her anger (visually depicted by a monster of the next color of the rainbow stepping out of the monster suit -- we move from hot colors to cooler A sweet story about helping a kid deal with her anger. Her brother offers her non-destructive ways to channel her anger, and each one helps level down her anger (visually depicted by a monster of the next color of the rainbow stepping out of the monster suit -- we move from hot colors to cooler colors). This is such a sweet book, and a fantastic tool to help the littles deal with their anger. Special shout out to the helpful older sibling! A great piece for preschoolers about dealing with angry/upset feelings. Not my favorite book about emotions although possibly the one that deals most comprehensively with anger. I like that the book addresses different calm down methods and I love that the characters are poc. But I don't like the monster-looking bit. It is okay to be angry! It does not make you a monster to have a full range of emotions. When Allie’s crayon breaks, she is suddenly furious and turns into a bright red anger monster. She stomps, smashes things and throws a tantrum. When her brother gives her a pillow to punch, the worst of the anger leaves. She climbs out of the red monster suit, now an orange monster. Her brother tells her to squeeze her favorite toy really tight. That helped more and soon she was a green monster. Her brother tries more techniques and Allie becomes blue and rather sad. Still, she is herself after When Allie’s crayon breaks, she is suddenly furious and turns into a bright red anger monster. She stomps, smashes things and throws a tantrum. When her brother gives her a pillow to punch, the worst of the anger leaves. She climbs out of the red monster suit, now an orange monster. Her brother tells her to squeeze her favorite toy really tight. That helped more and soon she was a green monster. Her brother tries more techniques and Allie becomes blue and rather sad. Still, she is herself after that and looking for a hug. This picture book brilliantly explores anger and healthy practices to release it and let it go. The use of different colored monsters gives children a visual meter of Allie’s anger and how she is steadily de-escalating it with her brother’s help. Told from her brother’s point of view, he is calm and steady throughout the book, knowing just what to do. The illustrations are a huge part of this book with the angry monsters showing a steady decline in anger until sadness is revealed. 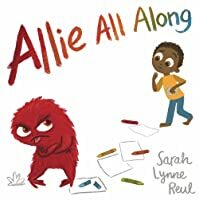 Premise/plot: Allie's brother helps her calm down and work through her many, many feelings in Sarah Lynne Reul's picture book Allie All Along. [For the record, I am guessing that it is her brother; it could just as well be a friend. Though a friend might be more likely to run far, far away until the st First sentence: SNAP! Allie's crayon broke. I blinked. She was suddenly...furious, fuming, frustrated, and so, so, sooo ANGRY. She stomped, smashed, crashed, and threw a tantrum, a fuss, and a fit. 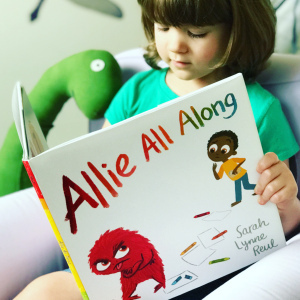 "Allie All Along" seems like it's targeted to younger picture book readers, and at one level, it is... Allie seems to be having a tough day and loses it when her crayon breaks. She gets so angry, she "loses it" (the ability to keep herself together). This colorful book is fantastic for teaching little ones about levels of emotion and helping them understand in a simple and smart way how their emotions might feel intense and overwhelming. 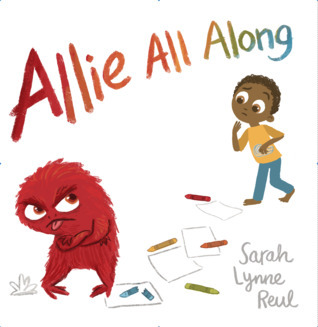 The great thing about "Allile" is that it works on another "Allie All Along" seems like it's targeted to younger picture book readers, and at one level, it is... Allie seems to be having a tough day and loses it when her crayon breaks. She gets so angry, she "loses it" (the ability to keep herself together). The great thing about "Allile" is that it works on another level equally well, as it's for older brothers and sisters too -- as it is Allie's older brother who walks her through (and helps her unpack) the torrent of emotions she feels, and doesn't yet understand, to get her back to herself. Allie was really upset when her red crayon broke. She was so angry, she turned all red. Her friend however, knew she was still inside and tried to help her calm down. By using multiple techniques, he was able to help bring Allie back. What I really loved about this book is how real it is. Allie was not expected to calm down right away. Rather, she went through stages of emotions to help her out. This book helps takes kids from an anger state to a rational state. Another point I want to make is h Allie was really upset when her red crayon broke. She was so angry, she turned all red. Her friend however, knew she was still inside and tried to help her calm down. By using multiple techniques, he was able to help bring Allie back. Another point I want to make is how this book uses colors to help Allie. She went from red and blue. This added visual is the perfect guide children need. I am very happy with this book. If you have a calm down center, I would recommend the addition of this book. Allie becomes 'furious, fuming, frustrated, and so, so, soooo ANGRY' when her crayon breaks. Her brother, the narrator, helps her calm down with various actions such as squeezing toys, punching pillows and taking deep breaths. Each action helps release some of the anger, till Allie reappears, having turned into an angry scribble monster. The story is cute, when her anger is gone Allie looks like herself again and asks for a hug. Her brother gives her one. We don't know why the broken crayon made Allie becomes 'furious, fuming, frustrated, and so, so, soooo ANGRY' when her crayon breaks. Her brother, the narrator, helps her calm down with various actions such as squeezing toys, punching pillows and taking deep breaths. Each action helps release some of the anger, till Allie reappears, having turned into an angry scribble monster. I really appreciate how this book teaches readers different techniques for calming down, including hugging a stuffed animal very tight and blowing as if one were trying to extinguish birthday candles, but the illustrations of the large monster who kept shedding fur to reveal another intimidating monster scared my preschooler and made her upset. While it fits with the themes of the book well, it's just not a book she was comfortable with. With sparse text and vibrant, meaningful illustrations the author has captured perfectly the quickly escalating rage of a young child and what he or she can do to make it better. I loved the layers Allie shed along the way as her temper calmed. I loved the brother, so intent on helping her. I loved the methods Allie used to diffuse her anger. And in the end she just needed a hug. Perfect. This colorful book does a great job of showing how a small child can overcome a strong emotion like anger. In this book Allie is in the midst of a meltdown but is able to work through her feelings and get herself together. Great read and easy for young children to relate to. A good learning tool to discuss how young children can manage their feelings. Beautifully simple book about a big brother and his very angry little sister, drawn colorfully like a furry monster. Doesn't demonize feeling angry and frustrated- it's written with great empathy. Ends as sister is helped to calm down and given a big hug. Just lovely. Can't wait to read during "Feelings" storytime. This book shows different strategies on how to calm down when you're really, really angry. The "monster" (Allie) also changes colors as her emotions change. Good book for discussing anger management with children. Allie All Along is a very sweet and important story about how a big brother patiently tries to calm down his sister. No matter how furious she gets, his love and respect for her remain strong. Subtle examples throughout the text provide excellent and useful ways to control anger. I don't know about this one...a lot of people rated it highly, and I guess it's great that it talks about dealing with anger in a healthy way. The text was just really...flat? And the illustrations were unremarkable and simplistic in a non charming way for me. Cute book about looking past the anger and finding the sweet person hidden beneath. Great strategies to teach kids how to deal with anger. Finally, loved that it was a sibling instead of a parent that was the helper! A great read-aloud for anyone (young or old) who has been ANGRY! Without passing judgement on the emotion, this story playfully imparts strategies to cool off. Reminds me of Mr. Rogers' song "What Do You Do With the Mad That You feel?" Loved it.